Marimbas come in all shapes and sizes, but all share some key characteristics. All marimbas have tuned wooden notes or bars which are struck to produce sound. The sound of these bars is amplified and extended by a resonating tube or chamber, and the whole instrument is held together with a frame. From the simplest folk marimba (as made in Africa centuries if not millennia ago) to the largest Western concert marimbas which are made today, all marimbas share these basic construction concepts. Decide what kind of wood you want to make the marimba bars from. For Western concert marimbas, rosewood is the gold standard. Marimba bars can also be made from other woods including padauk (or padouk), a reddish wood grown in southeast Asia and Africa. Synthetic materials suitable for marimba bar construction include Kelon, a blend of plastic and fiberglass with a very different sound from wooden marimba bars. Cut the bars of the marimba. Typically these notes will form a musical scale. Folk instruments may use a diatonic, modal, or pentatonic scale of only a few notes, while a concert marimba will use a chromatic scale covering up to five octaves or so. The exact measurements of each bar will vary (see "Marimba Bar and Resonator Data" in Resources). For a five-octave instrument, the lowest note will be approximately 22 inches long, 3 inches wide, and 1 inch thick; the highest note will be approximately 7 inches long, 2 inches wide, and 0.9 inch thick. Drill two holes through each bar, each a short distance in from the edge of the bar. Tune the notes individually. This is done by cutting the wood on the underside of each bar into an arch shape, and is a highly skilled job. String the notes together in order, by passing bar cord in a large loop through the upper drilled holes on all the notes, then back through all the lower drilled holes in the notes. The bar cord is made of synthetic and/or natural fibers, and needs to be long enough to pass twice through each set or sets of notes (on a chromatic marimba, the natural notes are strung separately from the sharps and flats). For a five-octave chromatic concert marimba, approximately 40 feet of bar cord, cut into two equal pieces, will be needed. Construct a resonator for each marimba bar you have made. Resonators are typically made of metal tubes in aluminum or brass, although in the folk instruments gourds are often used. Wood or cardboard can also be used to make marimba resonators. Construct a frame to hold together all the marimba resonators, and with hooks or posts to support the bar cord to either side of each resonator. At each end of the marimba frame, add additional hooks or posts for the bar cord to wind around. A primitive marimba has a frame like a small table, with vertical legs and horizontal strips holding the resonators in place. A concert marimba uses a frame more like a large trolley with wheels. Lay the marimba bars on the frame, with the bar cord passing through or over the hooks or posts. Pass the ends of the bar cords around the tensioning posts, pull the cord tight enough that the marimba bars are suspended over the resonators, and do not rest on the frame itself. Tie the bar cord in a knot at the end. If using rosewood, the best sound will be obtained from wood that has been aged for approximately seven years. Making a marimba involves working with wood and metal. Take all usual precautions when working with wood-cutting tools, and wear a mask to protect your lungs from wood and metal dust. 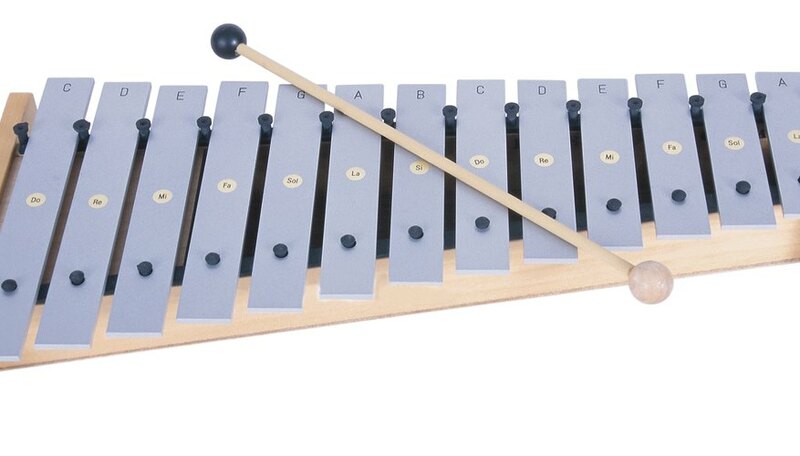 How Does a Xylophone Work?